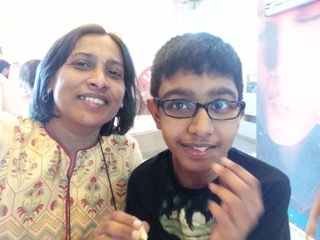 Today’s guest post is from Chitra Paul, a parent who uses Avaz with her son. I am Chitra Paul, Tarun’s mother and we are based in Bangalore, India. I am a clinical microbiologist by training and have worked for a few years before my son came into our lives. My career break became permanent when my son was diagnosed to be on the autism spectrum way back in 2008. Since then it has been a different learning path that I have been on. This led me to do my MA in Special Education and Inclusion from the University of Northampton, UK. My journey has made me into a proponent for inclusion for persons on the autism spectrum and I try not to miss any opportunity to advocate for them. My son, Tarun, is a 12 year old boy diagnosed with autism. He is currently studying in Grade 6 of a mainstream school in Bangalore, India. He is a loving child who enjoys going to school. He has a few friends in school and enjoys being with his classmates. He loves reading and listening to music. He is learning the keyboard and can sing a little too. His favourite hobby is watching advertisements and songs on YouTube. Being a parent to a boy with autism, I was constantly made aware about the importance of speech when my son was just diagnosed. However, what struck me as I read up more and more into this puzzle called autism was that many people were confusing speech for communication which was indeed the bigger challenge for these children. As my own son was non-verbal I too was constantly looking out for alternate options for him to communicate with. It was at this point that I happened to hear a talk by Mr. Ajit Narayanan at the Autism Conference at NIMHANS in 2011. Avaz impressed my husband and me at that time itself. However, it was a device and the cost factor put us off. But I continued to follow up closely how Avaz was being taken forward. Additionally, as my son was just learning language I put off introducing PECS or any other AAC. However, things changed around when he was 7-8 when his special educator working on her personal belief discovered that he could write extremely well in perfectly good English with grammar and vocabulary intact. However, he needed some support to his hand when writing. At this point we realised that we need to provide him with a means to communicate and of course the first place I turned to was Avaz. By then Avaz had been modified to an iPad application and we purchased it as the prices were also well within our reach. This is how our journey with Avaz started. Also included were “Yes” and “No” as well as “More” and “Enough” options. Folder customised to make choices regarding activities to be done during an Occupational Therapy session. Also included were “Yes” and “No” as well as “More” and “Enough” options. Folder customised to start a conversation during the Speech Therapy session. Folder customised to make request while learning to shop from a small corner shop. Items included were ones which Tarun likes. Folder customised to indicate choice of place to have a meal from while outside. However, as my son showed a greater inclination towards words and letters and not pictures, I realised I need to use only text when preparing the cards. That’s how we went about it. As my son had already shown that he was way ahead in using language and was already typing full sentences although nobody had taught him sentence formation etc., we started using the keyboard option at the beginning itself. Another factor was that my son also started typing which was much easier for him than writing. Because of these two factors I couldn’t make him to utilise Avaz in the usual manner as an AAC is advised to be started and used with children with autism. However, since Avaz came into his life, his communication has grown in leaps and bounds and we often have conversations using the keyboard option which can also be saved. As he takes his iPad to school for work and communication, I have also created a personalised folder of regularly used words and sentences so that he can use them if he needs to communicate for daily needs. We have also used the same technique and used personalised material on Avaz during his occupational therapy and speech therapy sessions so that Avaz is his constant support for communication. The best part of Avaz is that it is extremely simple and easy to create sets of communication cards. This was voiced to me recently by another parent, who took my suggestion and purchased Avaz to use with her daughter who is on the autism spectrum. Avaz also has other features that are very unique to the needs of users in India like the option to create and use cards in various regional languages. Another great feature that supports and helps a parent to learn and adapt to the needs of their children is their application called Communication Adventures. I have used many of the ideas and tips listed in both these applications. One of the ideas suggests using it while reading with your child. As my son loves to read, I have used this strategy many a time with great success. Some of these conversations were with his special educator, Ms. Priya, whose immense support helped him to reach this stage. We were reading poetry as Tarun likes reading poetry and this conversation followed that. This was a conversation between mother and son about sarcasm when it came up while reading some book. We had read the story of The Blue Carbuncle that is part of the Sherlock Holmes Series and this was a mini conversation we had following that. Do you have a story that you would like to share with us? Leave us a comment!